One of my favorite blogs I follow is Smashed Peas and Carrots. When Maggie from Smashed Peas and Carrots posted a tutorial on how to make Shamrock Garland, I knew I had to make this! I also thought it would be a project Will and I could do together. It was so quick and easy. I just love how it turned out! Each shamrock takes four strips of paper (three for each leaf and one for the stem). Here is how you make each leaf (heart). Take one strip and crease it at the fold. Pull the open ends towards the middle (see arrows) and pinch/hold with your fingers. Staple the ends together and viola a leaf! Repeat this for the other two leafs. Staple the two leave to the third. Leave the bottom two leaves open (not stapled together) so you can attach the stem. Staple the stem between the bottom two leaves. Using your fingers slightly curl the stem. To turn the shamrocks into garland I just stapled each shamrock to the next. I really wanted to hang my garland from my fireplace mantel, but couldn’t figure out how to do it. I ended up pinning with mini-clothespins to a piece of twine I have strung in my kitchen dining area window. I love how it jazzes up the blinds for the season! Thanks, Maggie, for the cute idea! All this talk of shamrocks is making me hungry for a McDonald’s Shamrock Shake! I hope I can get at least one more before they are gone for the season. We finally did another stART project this week. It sure has been a while. Will and I had a fun spending time together doing something creative. I hope you like our project! We read the book “Snowmen at Night” by Caralyn and Mark Buehner. It is a cute book that explores the adventures snowmen have at night. While we are sleeping, snowmen have all sorts of fun playing which may leave them looking disheveled in the morning. Will just loved the one snowman in the story who had a pickle for a nose instead of a carrot. He just kept laughing and pointing it out on every page. 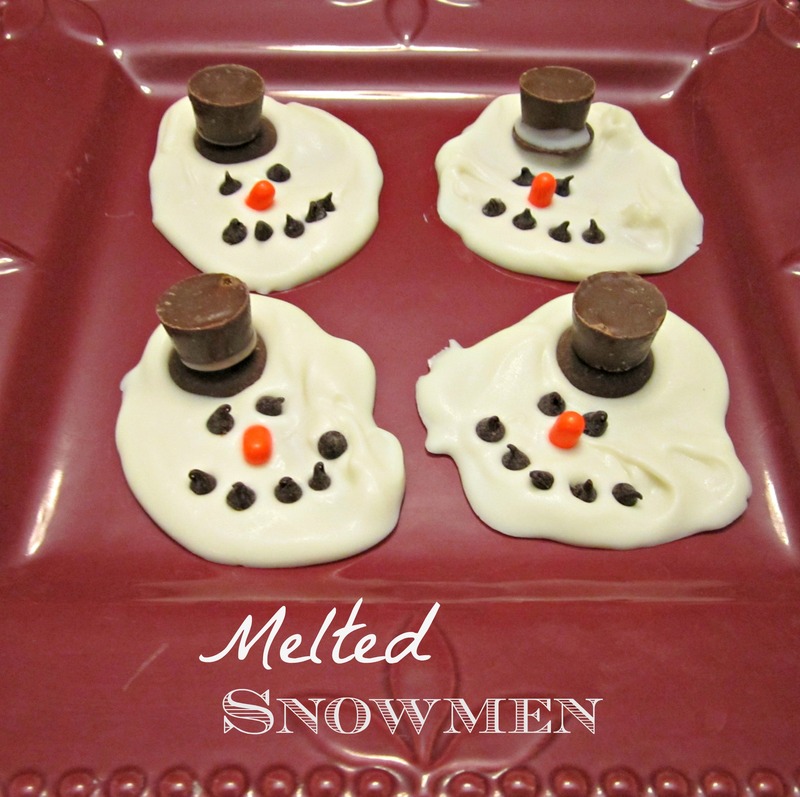 For our project we made Melted Snowmen treats. I found this idea on Pintrest which led me here at Parents Magazine. 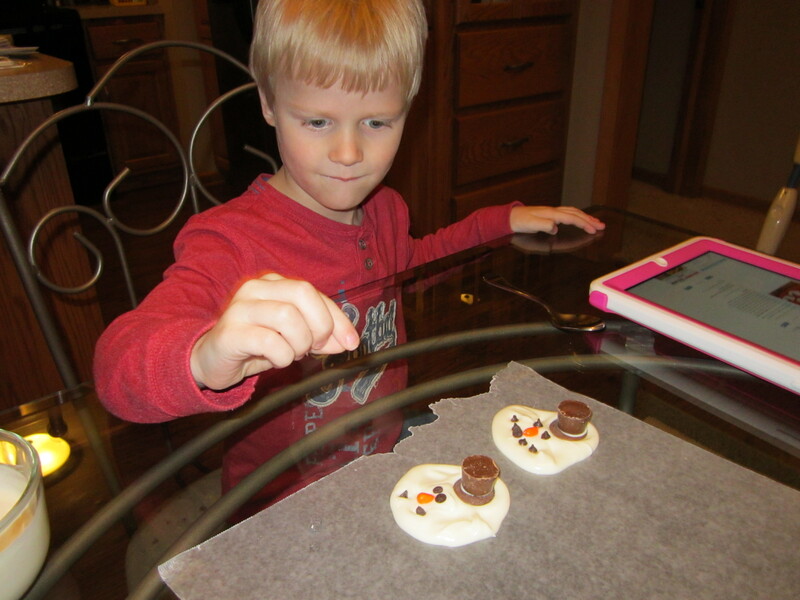 These treats were quick and easy — just the right project for a 4-year-old and his mom while the baby jumped in his jumper! Win-win for everyone! 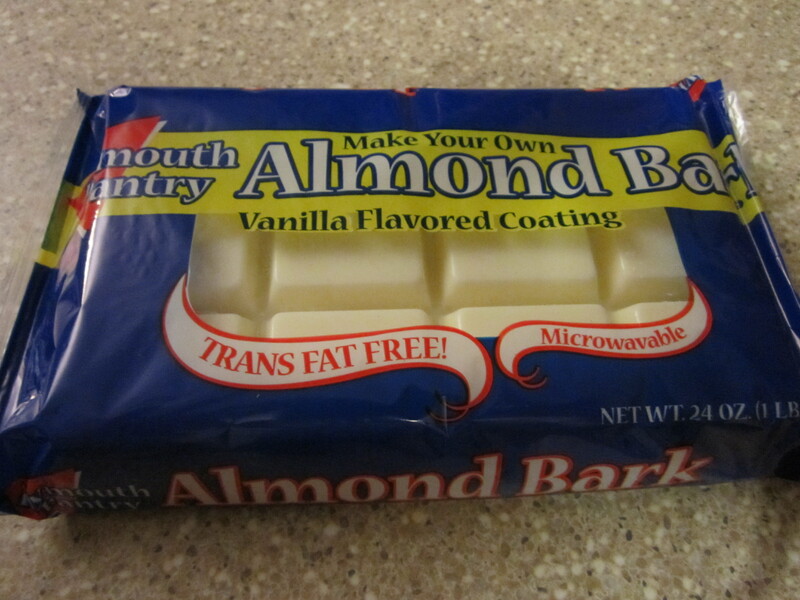 First, melt almond bark (or candy melts) according to the directions on the package. After it is melted drop a heaping tablespoon of candy in a blob on waxed paper. 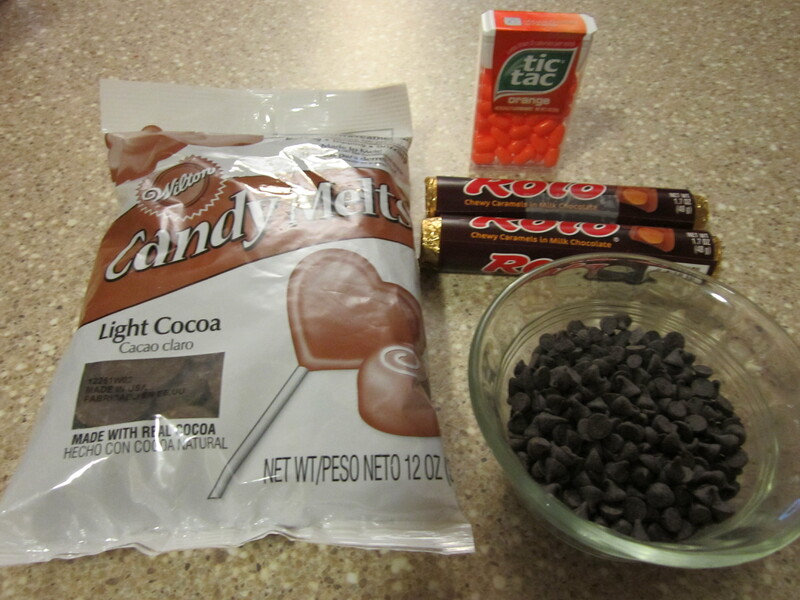 Use the spoon to spread out the candy and shape it. I put each item in a small bowl to make them easier to get at since we needed to work fast before the almond bark hardened. Looks like our weather in the Midwest will be changing from melted snowmen weather to FREEZING in the next few days! This year we celebrated New Year’s Eve “in”. We threw together an impromptu party with some friends and their kiddos! We even got really wild and rang in the New Year Eastern time (instead of Central time) so we can get the kids to bed (aka – us) earlier. HA! We decided we are all getting old. I wanted to share the recipe for Crock-pot Hot Chocolate I got from Maggie at Smashed Peas and Carrots. It was a hit at the party. So easy and so, so rich and yummy! Combine the cocoa powder, sugar, and salt together in your crockpot. Add in the milk and vanilla and whisk everything together until smooth and well-combined. Cover and cook on low for 2 hours. After a couple of hours it will look frothy on the top like this. 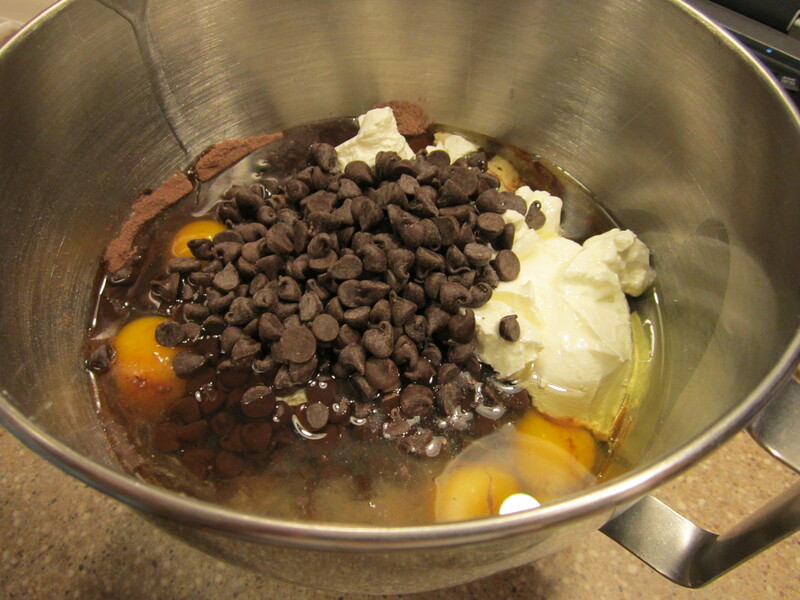 After 2 hours, add in the heavy cream, white and semi-sweet chocolate chips. Stir until chips are melted. After about 10 minutes, serve in mugs. I created a hot chocolate bar for the guest to enjoy. I offered whipped cream, mini chocolate chips, caramel pieces, candy canes and mini marshmallows to add to their hot chocolate. 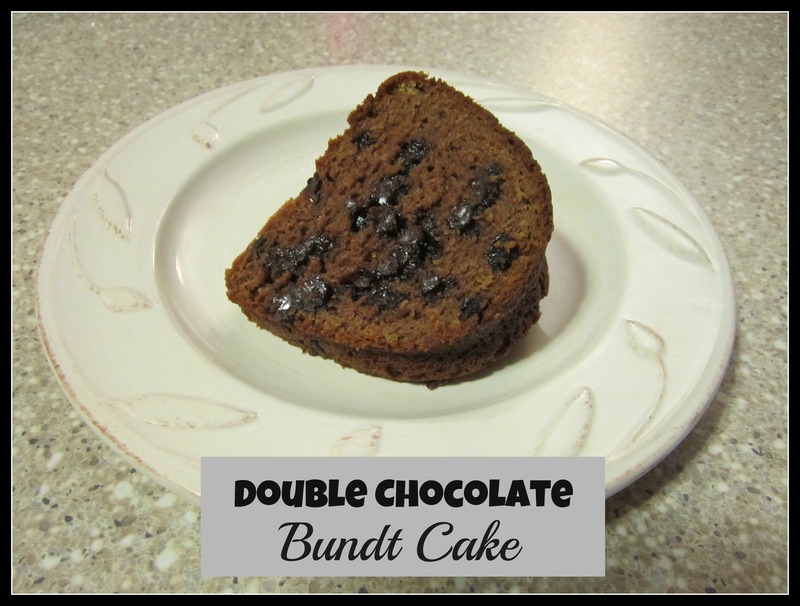 A big thank you to Maggie for posting this recipe on her blog! It was fantastic! Not a drop was left at the end of the night. My aunts came to visit today to meet the new little guy. I thought it would be fun to try a new recipe to serve for dessert. 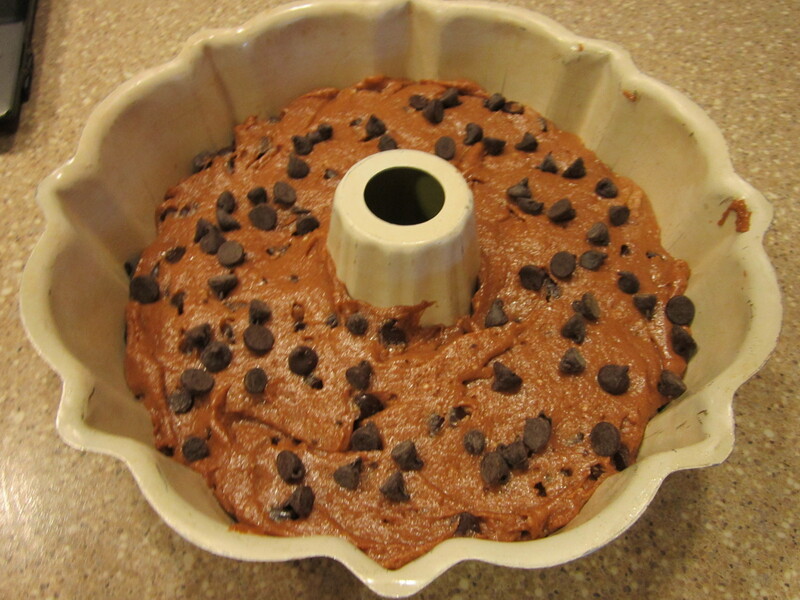 I finally went into my “Favorite Recipes” board on Pintrest and actually made this luscious piece of chocolate heaven! It was pretty easy and tasted yummy! My 4-year-old kitchen assistant was at my side to help, too! He just loves to help bake (and snitch a piece of something sweet as we work — he does have his mom’s sweet tooth). The Pintrest post didn’t link to a website, so I’m not sure what the original source is. There was only a picture and the recipe. Warning: Pictured is a tub of Sour Cream with chives. I didn’t realize I had bought that until I opened it to add to the bowl. I was glad I saw the little pieces of chives in there before I dumped it in. I had to drive back to the store and get plain sour cream – whew! 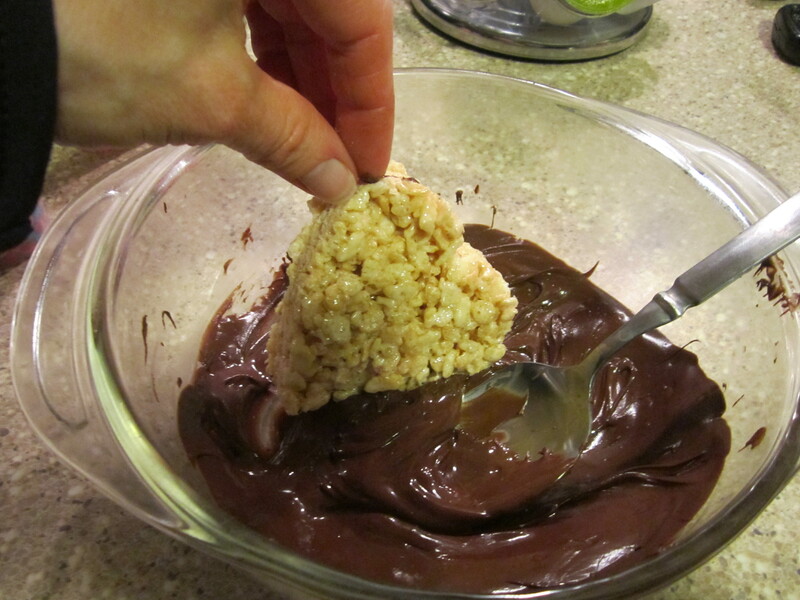 Mix all the ingredients in a bowl, but only mix in 1/2 of the bag of chocolate chips. Pour half of the batter into a greased bundt pan. 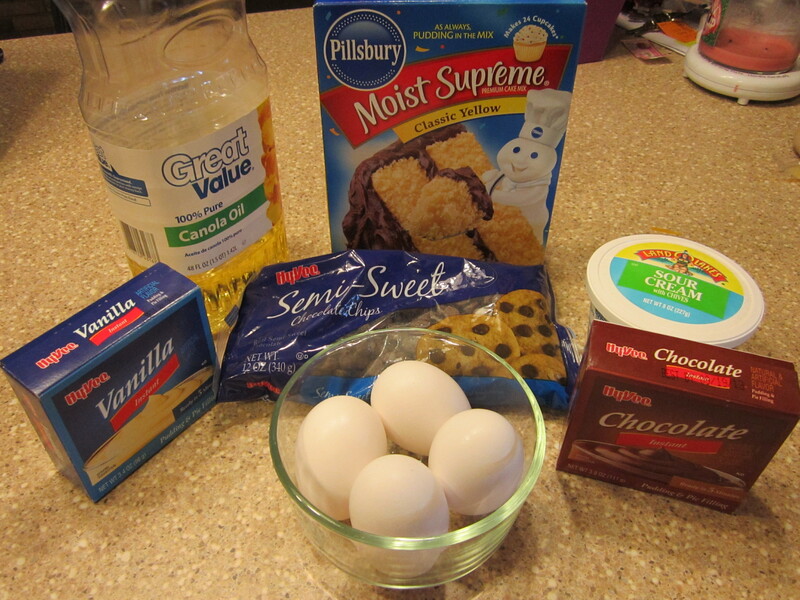 Next, layer the other 1/2 of the bag of chocolate chips (save a few to garnish the top of your cake). Layer the rest of the of the batter. 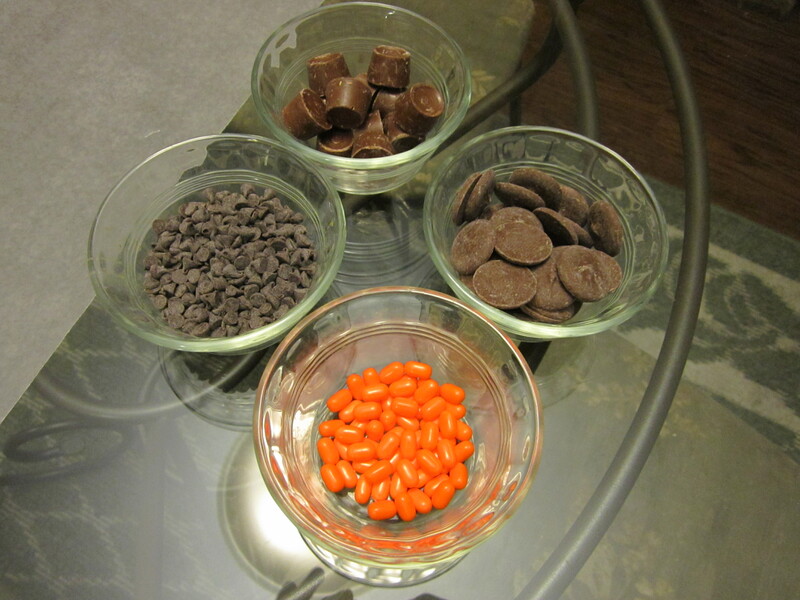 Garnish with the remaining chocolate chips. Bake at 350 degrees for 50 minutes. I served the cake with vanilla ice cream. It rich chocolatey goodness! Who doesn’t love Monster Cookies? 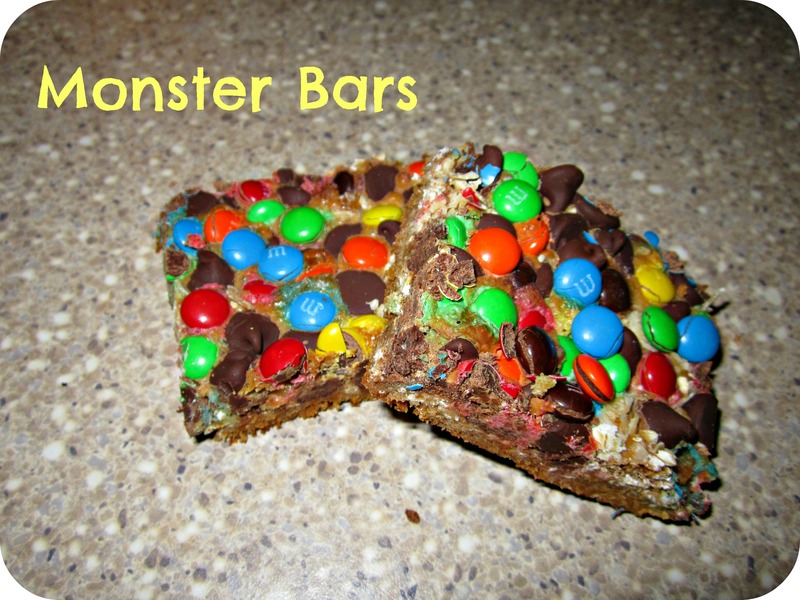 Well, when I saw the recipe for these Monster Bars, I had to try them. They are very similar to the cookies, although the bars don’t have any peanut butter in them. 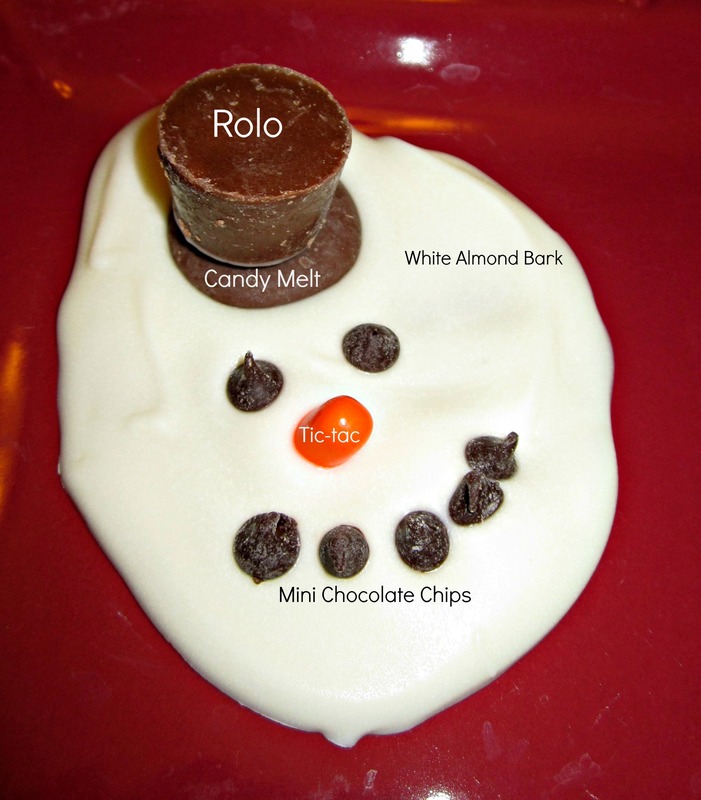 I may try to add some next time I make these delicious, sweet things! 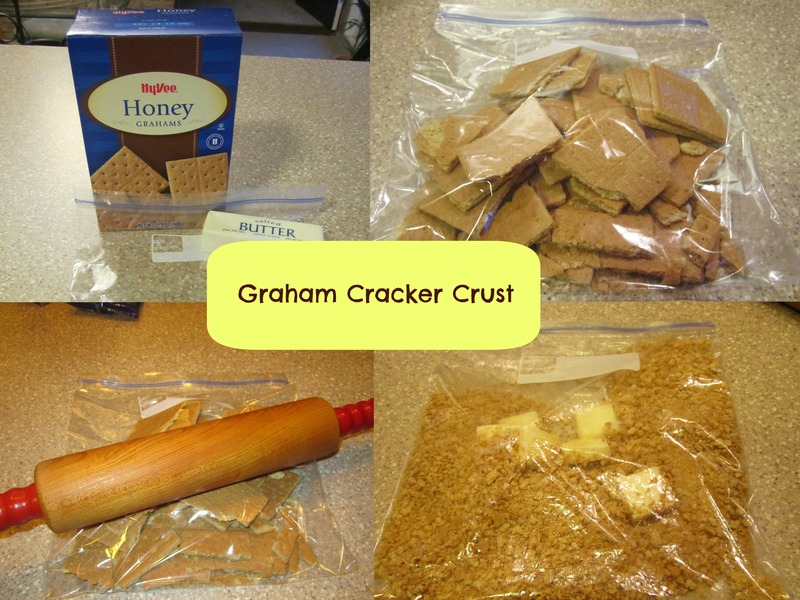 Place nine full-sized graham crackers in a ziplock bag and use a rolling-pin to crush them up for the crust. 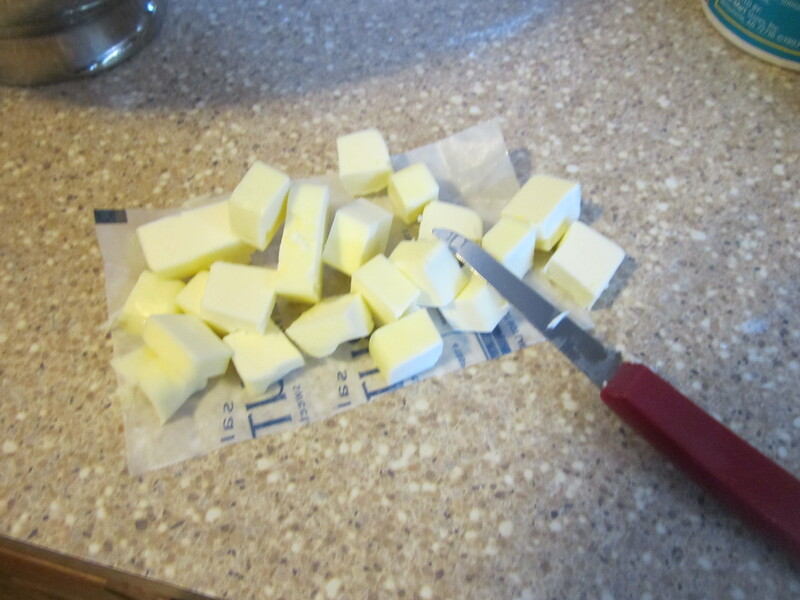 Add the 4 T. of butter to the bag, seal and place it in the microwave for about 30 seconds to melt the butter. Remove from the microwave and make sure to let the air out of the bag. 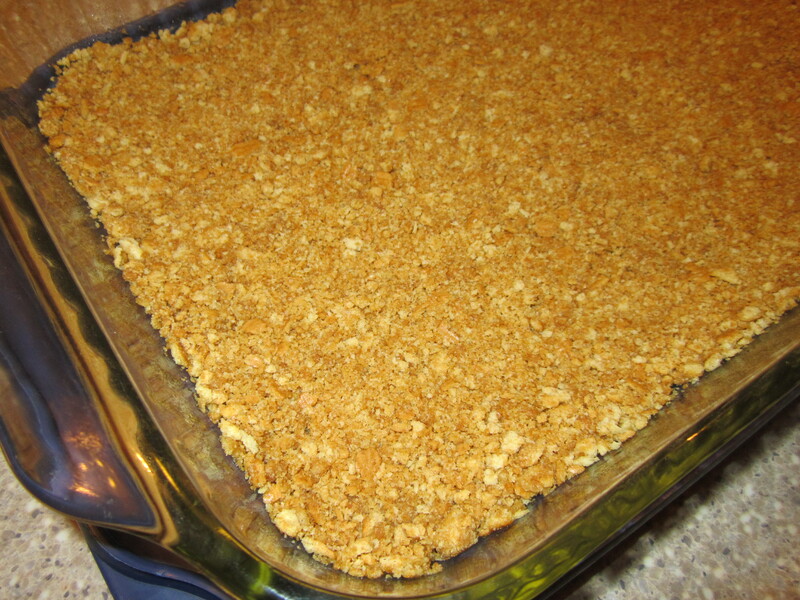 Smoosh the butter and graham cracker crumbs together to make the crust. Press the graham cracker crust into a well-greased 9 x 13 pan. 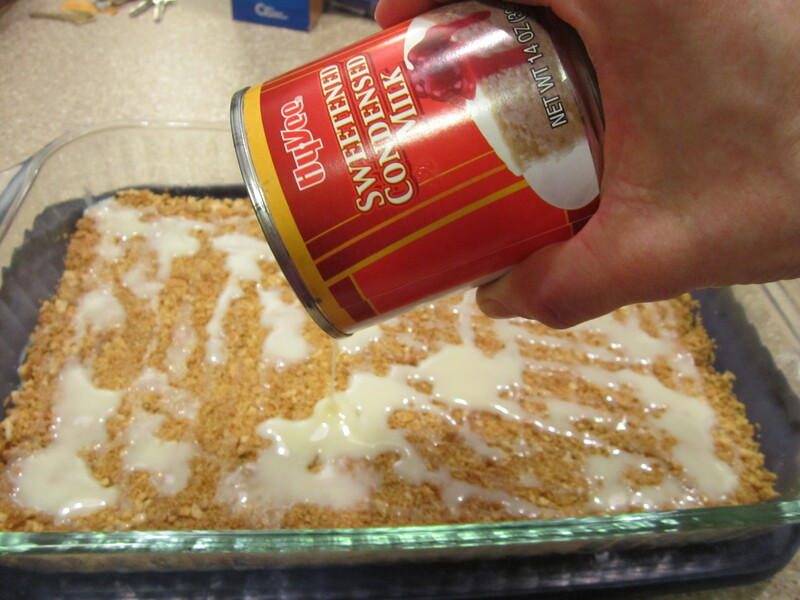 Pour the whole can of sweet condensed milk evenly over the graham cracker crust (this is the good stuff!). 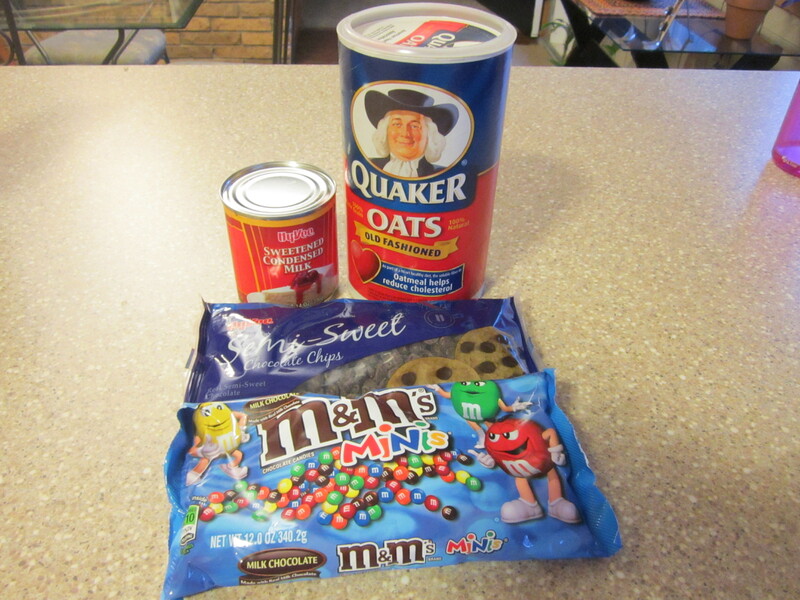 Next, layer the oats, semi-sweet chocolate chips and M&Ms. I used the M&M minis for fun. Bake in the oven at 350 degrees for 30 minutes or until browned and slightly pulling away at the edges. ENJOY!!!! This is a yummy treat you won’t be able to leave alone or keep in the house long. I took them to serve for dessert Saturday night to my family. We had two left over and those two didn’t last any longer than the next day. Last week Will was asking to take treats to daycare. He just loves bringing treats, mostly because he gets to pass them out to the kids, I think. 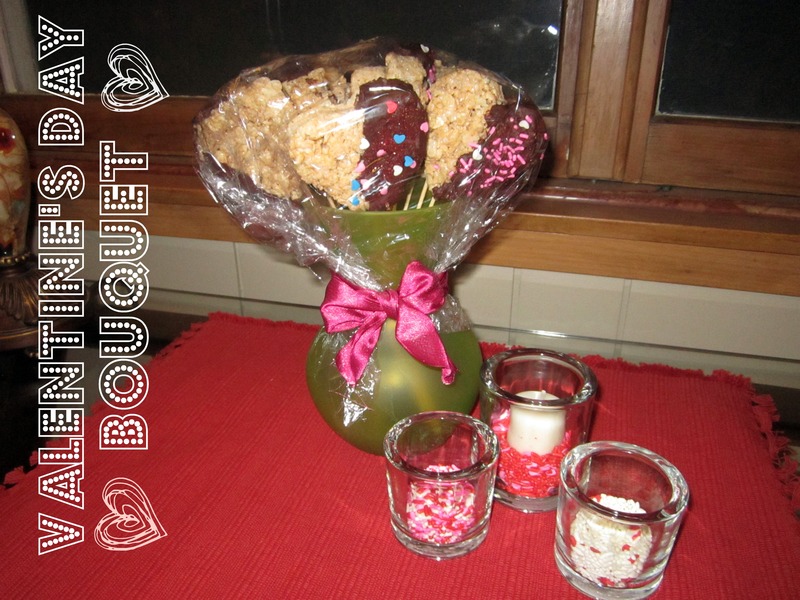 Here is another Pintrest recipe I found that was fun to try. 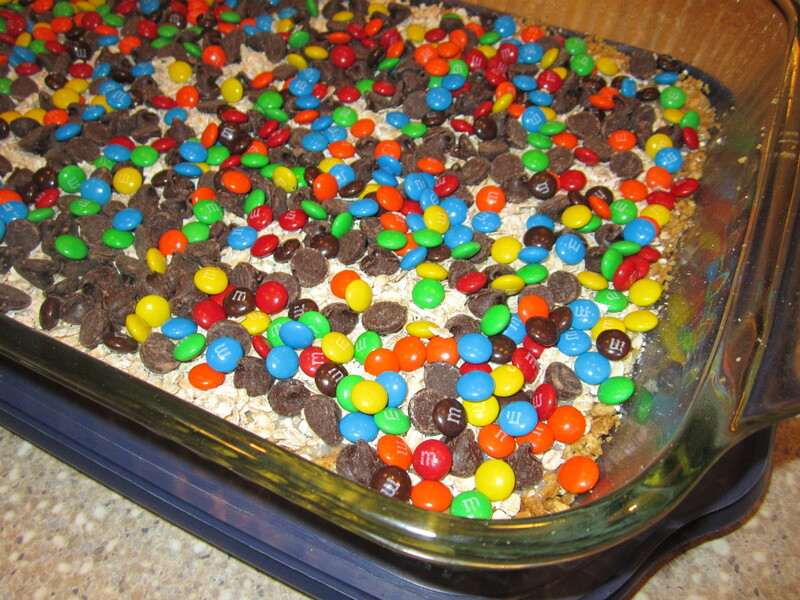 First, Will and I worked together to make a 9 x 13 pan of Rice Krispie bars. 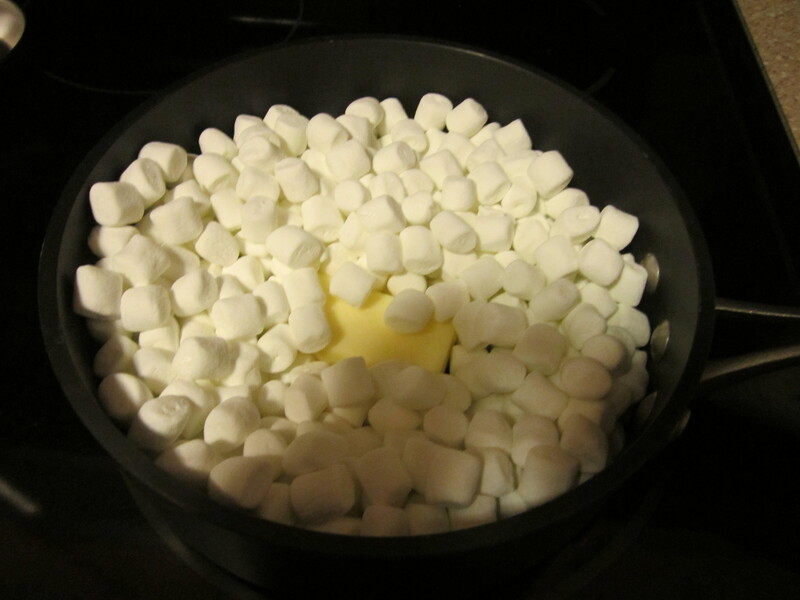 Melt a bag of mini marshmallows with 3 Tbsp. butter. 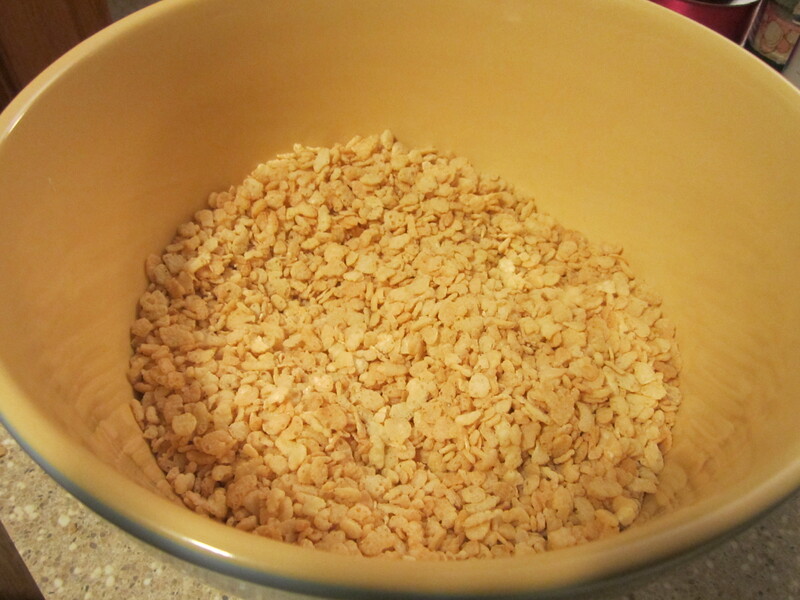 Pour melted mixture over 6 cups of Rice Krispies cereal and mix. Press the mixture into a greased 9 x 13 pan. 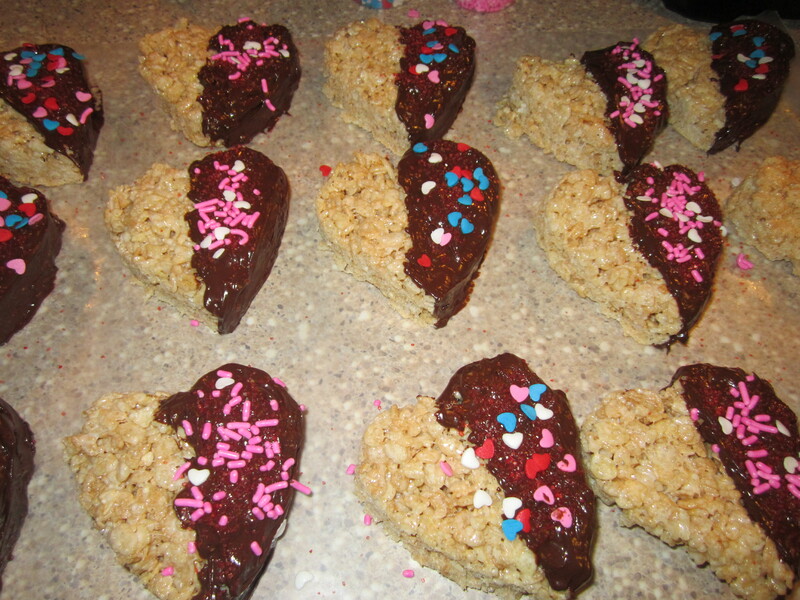 I used a heart-shaped cookie cutter to cut out the heart shapes. 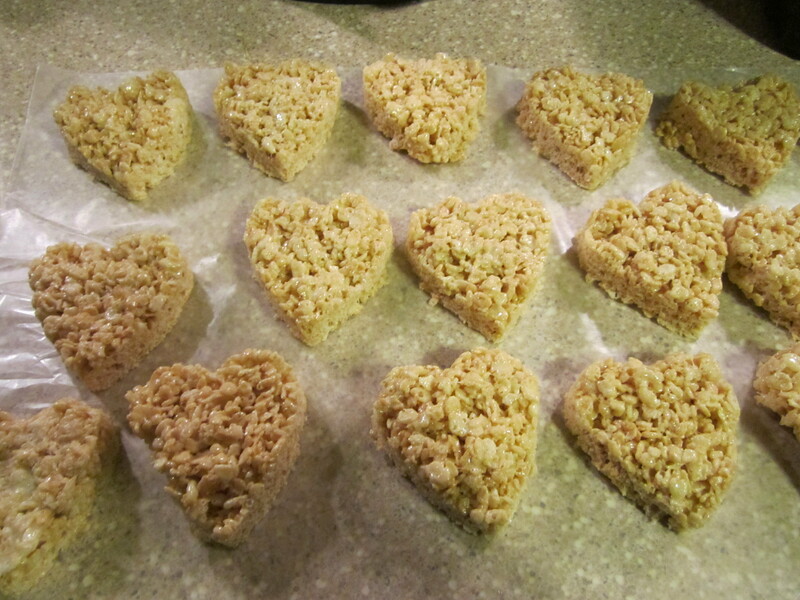 I had to piece a few together, but I got 22 hearts out of one pan of Rice Krispie bars. 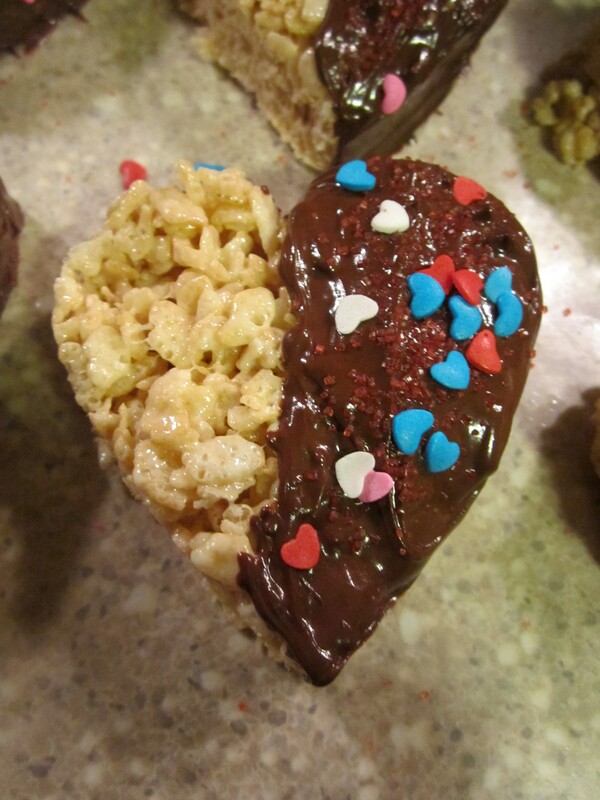 I melted some semi-sweet chocolate chips in the microwave and then dipped half of each heart in the chocolate. 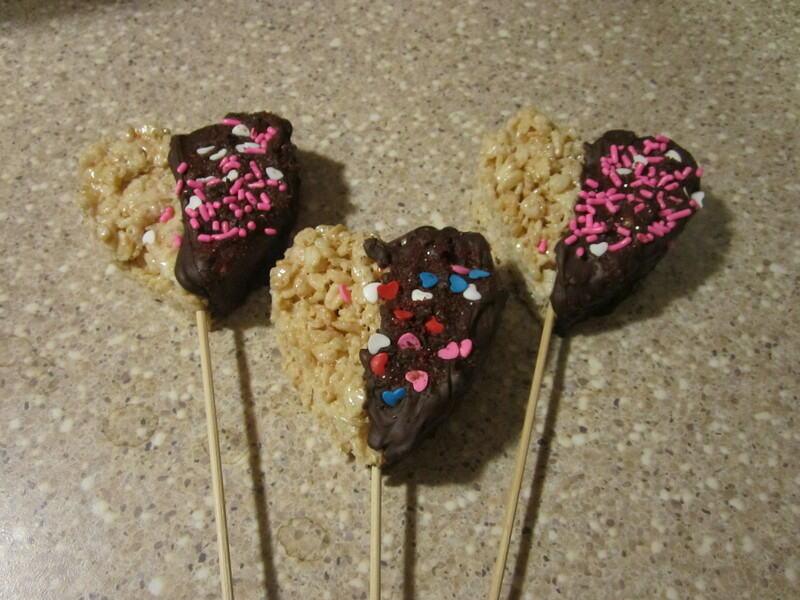 Last, I inserted a skewer into the end of each heart to make them into heart pops! 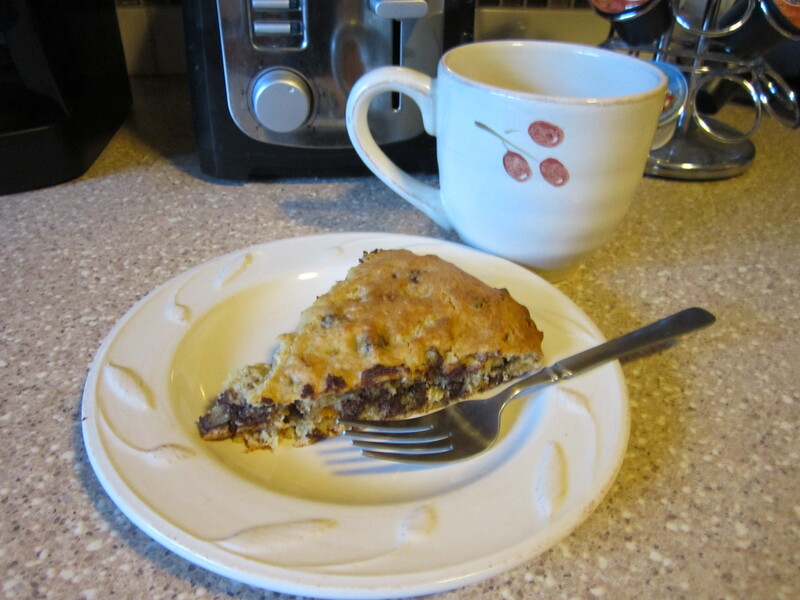 Here is another recipe I enjoy when I have ripe bananas! Preheat oven to 400 degrees. Lightly grease a 10-in-diameter circle in the center of a baking sheet. 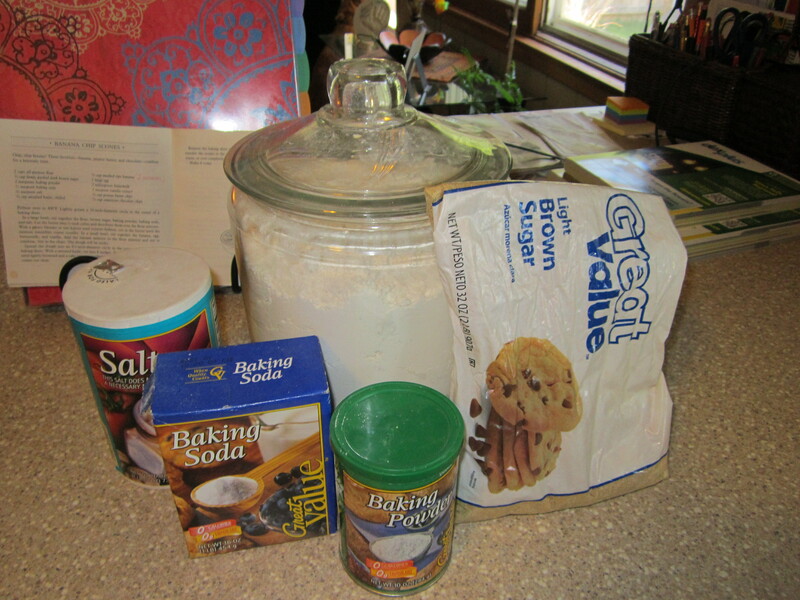 In a large bowl, stir together the flour, brown sugar, baking powder, baking soda, and salt. Cut the butter into 1/2 inch cubes and add them to the flour mixture. With a pastry blender or two knives used in a scissor fashion, cut in the butter until the mixture resembles coarse crumbs. 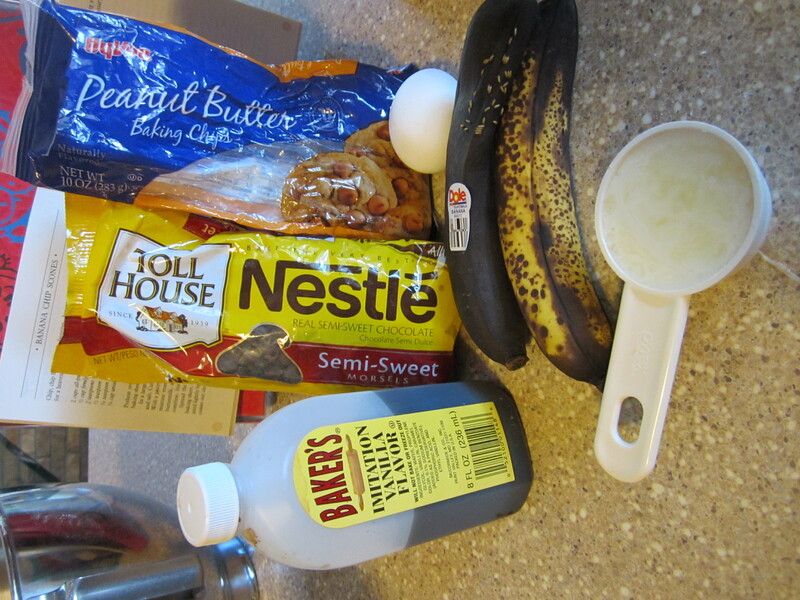 In a small bowl, stir together the banana, egg, buttermilk, and vanilla. I never have buttermilk on hand to make these so I quickly learned to make a buttermilk substitute. 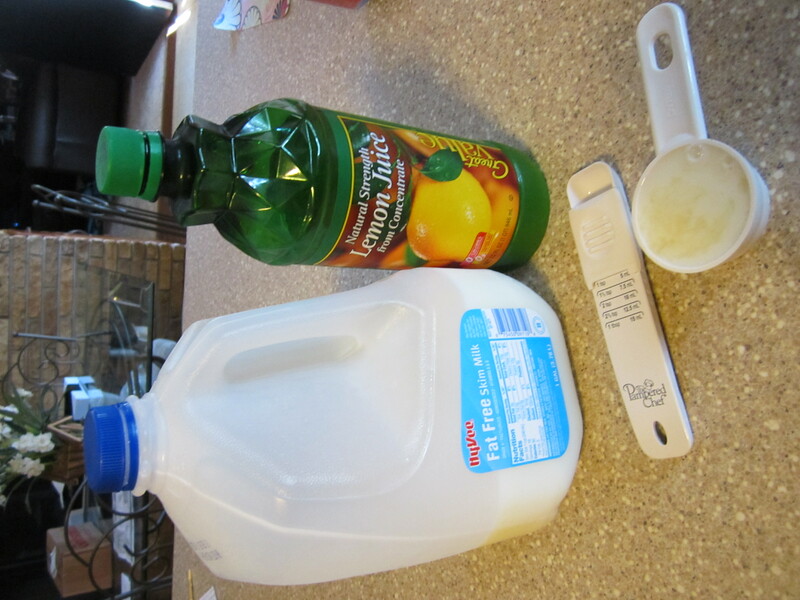 I take a cup of milk and add 1 T. of lemon juice to it and let it sit for 5 minutes. I very the amounts depending on how much I need. Add the banana mixture to the flour mixture and stir to combine. Stir in the chips. The dough will be sticky. 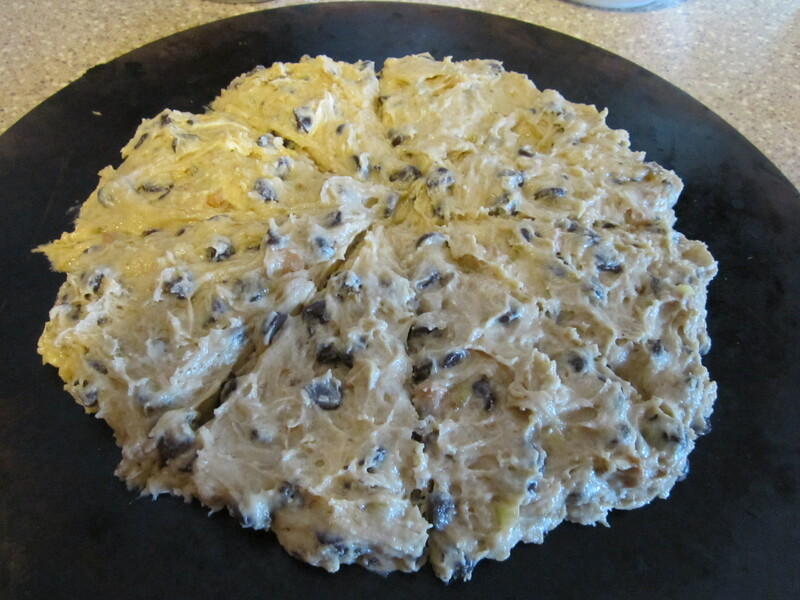 Spread the dough into an 8 1/2 inch diameter circle in the center of a prepared baking sheet. With a serrated knife, cut into 8 wedges. 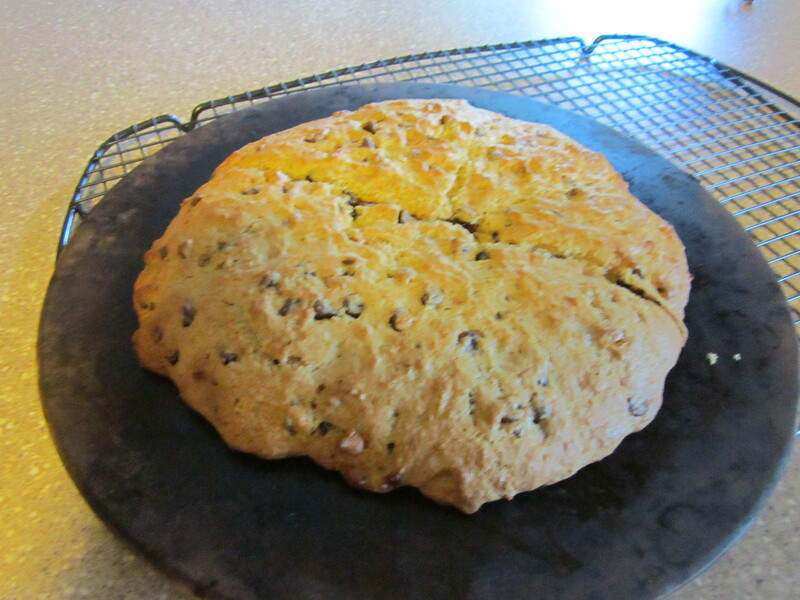 Bake for 19-21 minutes, or until lightly browned and a toothpick inserted in the center of the scone comes out clean. Remove the scone to a wire rack and cool for 5 minutes. Recut into wedges.